Align with the leading brand in decking, railings, balusters, post caps and more. As a Certified Pro, you will join an exclusive group that receives benefits designed to build and promote your business. Why become a Certified Pro? Our website and other marketing initiatives drive local project leads directly to you. Earn points for every dollar spent on Deckorators purchases. Log your receipts to earn points and cash your points for Visa® gift cards. You'll be highlighted on our website with an icon noting certification. Training, resources, promotions and a chance to attend the Deckorators Pro Summit. Partner with innovative products and industry-leading warranties. Opportunity to be aligned with qualified deck builders through the Deck Builder Summer Apprenticeship Program. We’ll share our confidence in your work through email, social media, trade shows and possibly through our Certified Pro Spotlight, which highlights experienced contractors like yourself. Contact info will be on Deckorators.com with a certification icon and local homeowners will be directed to Certified Pros. Welcome Kit with marketing and sales tools. Access to the Certified Pro Rewards site to upload receipts, receive cash back and notifications of Certified Pro-only promotions. Contractor website to promote your business. Our composite and aluminum warranties are the first of their kind, providing 25-year limited removal & replacement protection. When we say removal & replacement, we mean just that. Product removal, product replacement and labor. 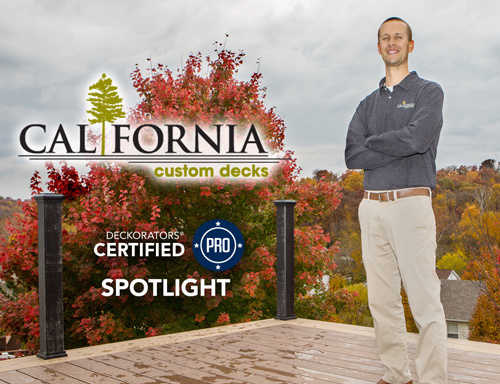 Nobody stands behind their product or building professionals like Deckorators. We have your back. Learn more. Certified Pros will be the first to know about new products and promotions prior to the official launch of these initiatives. Our Certified Pros will have direct access to the Deckorators team to ask questions through our Pro Hotline, provide valuable feedback on how to improve our program and insight on our new product lines. A marketplace exclusive for Certified Pros to help you grow your business! Use your reward point Visa® gift cards or credit cards to purchase Deckorators apparel, custom-made marketing pieces, and more. If you need help with access, contact us. From quoting jobs to building beyond ordinary decks, your time is valuable. We get it. That's why we've designed the new Pro on the Go app with you in mind. Certified Pros can submit invoices and earn reward points - on the go! Download the Deckorators Pro on the Go mobile app today! Already a certified Pro? Login Here. We want customers to know we have experience and that we have certification and a relationship with the manufacturer.